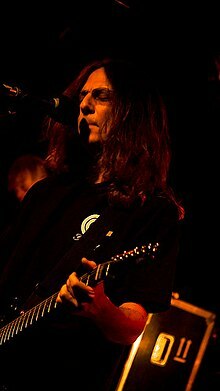 The Jelly Jam is a progressive rock trio super group, consisting of King's X member Ty Tabor on guitar and vocals, Winger and Dixie Dregs member Rod Morgenstein on drums, and Dream Theater member John Myung on bass guitar. Their first album, The Jelly Jam, was released by InsideOut Music in 2002. Their second album, The Jelly Jam 2, followed in 2004. ^ "The Jelly Jam". AllMusic. Archived from the original on 29 September 2017. Retrieved 24 June 2018. ^ a b "The Jelly Jam - The Jelly Jam - Songs, Reviews, Credits - AllMusic". AllMusic. Archived from the original on 2 May 2016. Retrieved 24 June 2018. ^ a b "2 - The Jelly Jam - Songs, Reviews, Credits - AllMusic". AllMusic. Archived from the original on 30 September 2017. Retrieved 24 June 2018. This article on a United States rock music band is a stub. You can help Wikipedia by expanding it. This page was last edited on 24 June 2018, at 15:41 (UTC).